. . . The fourth world congress of the Communist International observes that Soviet Russia, the proletarian State, now that it is no longer forced to defend its bare existence by force of arms, has turned with unexampled vigour to the construction and development of its economy, keeping steadily in sight the transformation to communism. The separate stages and measures leading to this goal, the transitional steps of the so-called new policy, are the outcome, on the one hand, of the particular given objective and subjective historical conditions in Russia, and, on the other, of the slow rate of development of the world revolution and of the isolation of the Soviet republic in the midst of capitalist States. . . . The fourth world congress reminds the proletarians of all countries that the proletarian revolution can never triumph completely within a single country; rather must it triumph internationally, as world revolution. 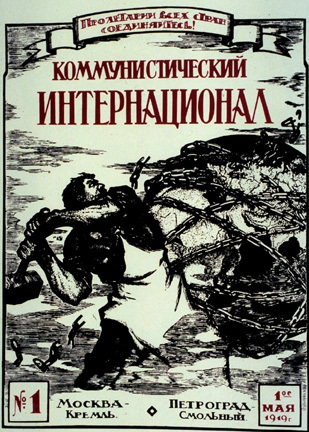 The labour of Soviet Russia, its struggle for existence, for the achievements of the revolution, is the fight for the liberation of the proletarians, the oppressed and exploited of the whole world, from the chains of slavery. The Russian proletarians have more than done their duty as the revolutionary protagonists of the world proletariat. The world proletariat must at last do theirs. In all countries the workers, the disinherited, and the enslaved, must proclaim their most active solidarity, moral, economic, and political, with Soviet Russia. Not merely international solidarity, but their own most fundamental interests demand that for this purpose they must take up the sharpest fight against the bourgeoisie and the capitalist State. In every country their battle-cry must be: Hands off Soviet Russia! De jure recognition of Soviet Russia! Active support of every kind for the economic construction of Soviet Russia! Every strengthening of Soviet Russia means a weakening of the world bourgeoisie. The five years of Soviet Russia's existence is the most severe blow that world capitalism has ever received, and one from which it will not recover.